A body pillow is a pillow with dimensions stretched to the length of your body. 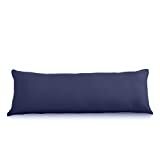 In many cases, they are like a regular head pillow but longer and sometimes thinner. 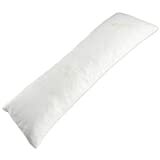 A body pillow also features memory foam or regular polyfill, and can vary in its softness or stiffness. Some are suitable for alleviating pain, while others are more for comfort. The price tag, style, shape, and materials all can differ. It’s up to you to check out these options below and decide on a pillow that ticks all the boxes for your needs. Finding a body pillow that’s not lumpy and uncomfortable might seem impossible, but thanks to Snuggle-Pedic, it’s not. This body pillow with shredded memory foam, lycra, and polyester, is the epitome of comfort. It doesn’t matter whether you want a decent night’s sleep or you have chronic pain, this pillow will tick all the boxes. There are several reasons why it stands out ahead of the competition. Firstly, it’s affordable. Almost anyone can own this pillow, while also receiving a generous 120-day sleep trial and 20-year warranty. Very few other manufacturers offer such a setup. Then, it’s convenient to care for and use. The cover is breathable and keeps you fresh but you can also wash the 54 x 20-inch pillow as well. It’s also eco-friendly, hypoallergenic, and harbors no unfriendly dust mites. If you have been looking for a pillow to take your sleep to the next level, this one could be the answer. Even though this body pillow retains a lot of heat and tends to be quite noisy when you lie on it, it’s still an affordable and durable pillow all the same. The first standout point is that you can choose one of five pattern options. You don’t have to stick with that same old generic pillow pattern they all come with. Then, enjoy being able to purchase the body pillow with or without the cotton cover. If you have your own cover to go on it, you can save some money. Otherwise, the breathability, cleanness and hypoallergenic properties of the cover are going to appeal. There is also many other things to love about this 54 x 20-inch pillow. It has durable and comfortable polyester fiberfill, is easy-care, and you can use it if you want a decent night’s sleep or have chronic pain. If you need to wash it, this process is straightforward too. Put it in your washing machine and let technology take care of all the hard work. When it comes to quality, comfort, and affordable, this pillow is going to feature high on the list. If you’re a side sleeper, you may find this body pillow more than meets the mark for your needs. If you sleep on your back, however, you may find the pillow flips up at the sides to meet your face. This, and not having enough stuffing for some people, are the only two problems you might face with this pillow. When it comes to all other features, it’s bound to impress. Unlike several other body pillows on the market, with this one, you can adjust the fill. If there is not enough or too much, you can add some in or take some away. If you suffer from allergies, this body pillow will put a smile on your face. It’s antibacterial, has a hypoallergenic cotton pillowcase, and is mite-resistant too. You may get the best night’s sleep you’ve had in some time. The top of the pillow is also quilted for comfort, and it won’t fade if your bed faces the sun either. What’s more, if you find you need to clean it, you can pop it in your washing machine and call the job done. With 7D polyester and a generous 21 x 54-inch size, this body pillow may be one that’s well worth your consideration. If you want to be comfortable when you head to bed, then this memory foam body pillow from Golden Linens might be the answer. As a hotel quality pillow with a lot to offer, it’s bound to satisfy your cravings for a decent night’s sleep. The memory foam filling, which contours to your body, is hypoallergenic and resistant to mites. It’s also luxurious, helps to alleviate neck and back pain, and could even spell the difference between you snoring or not. That’s not all you will enjoy about this body pillow either. Because the cover has a zipper, you can remove it, wash it, then put it on your pillow to look as good as new. However, what you may find is that when you first use it, there is a strong factory odor. The shredded memory foam within may also bunch up. The price tag may also be a little much for some people, but given how durable and high-quality this pillow is, it’s also not out of the question. Invest in better sleep with this body pillow from Golden Linens. Some body pillows are too flat, too lumpy, or too full, and you are never going to please everyone. Fortunately, this body pillow comes fairly close to doing so. It can take a while to return to its shape and is a bit too over-full for some people, but they are two minor drawbacks in the scheme of things. Overall, this body pillow could be everything you need, and more. You can buy it in one of five sizes – either in a set of one or two. 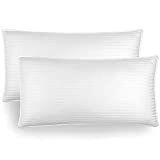 It’s hypoallergenic, free of animal products, and has an extra-long 58-inch length to suit your needs more than some other pillows on the market. The interior filling is also precision-cut memory foam which holds its shape and contours to your body. Even the cover is something special. It’s breathable, durable, and will take a beating in a washing machine too. In essence, this body pillow is the full package. You will have to save your pennies a little longer to afford it, but you will see it’s worth it even from the first night you lay down your head. For many people, this body pillow is not perfect. It’s not firm enough, not supportive enough, and doesn’t have enough filling. For equally as many, however, it’s perfect. The comfort level can be a personal preference, and the extensive list of features will ensure you realize there is also a lot to love about this body pillow from Cheer Collection. Firstly, you can choose from two size options: 90 x 19 inches and 15 x 100 inches. The size you choose can depend on why you are buying it – for comfort or pain relief. The microfiber construction may also appeal, giving you both support and padding to see you through a night of sweet relief. It can prevent sciatica pain, eradicate lower back pain, and relieve pressure where you want it gone the most. It’s not a miracle body pillow, but for many people, it ticks all the boxes. If you find yourself using this body pillow to the point of it needing a decent wash, then that’s not a problem either. The cover has a zip so you can remove it and put it in the washing machine. Once it’s back on, it will continue to look as good as new, while regulating your temperature as you sleep on it. This body pillow is going to get heads turning, especially as you can feel far brighter and more comfortable after using it! The body pillow market is expansive, but you may find the quality of the options in it are not always the best. This Simply Slumber body pillow bucks the trend. As a 54 x 20-inch pillow, it’s large enough to cater to your needs, but also features top-of-the-line materials to back up its higher-than-average price tag. The filling is shredded memory foam which contours to your body shape. However, if you like to move around and scrunch your pillow. It’s malleable for you to do this. On top of the memory foam is a breathable bamboo fabric cover. The cover is soft, supple, and will not cause you to overheat during the night. When the time comes to wash it, you can unzip the cover then put it in the washing machine. The high price tag of this body pillow might have some people looking elsewhere, but there’s a reason it’s so high. It’s a quality body pillow that comes with a generous five-year warranty and a plethora of reviews to back up its efficacy for pain management and a decent night’s sleep. Don’t let the factory smell put you off when you receive this body pillow, for this tends to be one of the few problems with the pillow. You are bound to find the positives outweigh the negatives. This body pillow comes from the United States, features a comfortable blend of rayon bamboo, memory foam, and polyester, and you can wash the entire pillow – cover and all. It’s also free of toxins, has certified foam, and is resistant to mites too. What you may also like is that its generous size allows for a comfortable night’s sleep. It will contour to your body, is breathable so you don’t overheat, and is only lumpy for a few people. If you need a new body pillow, this one could be it. If you like your body pillow to be firm and of a unique shape, then set your sights on this one from Cheer Collection. Instead of a regular rectangle shape like others, you can choose one that’s available in a J, L, V, or U shape. Whichever you think you will find more suitable for your pain or comfort levels, Cheer Collection can deliver. 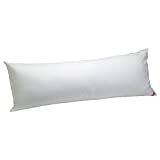 This pillow features an outer pillow case – which you may find is not durable – and firm fiber fill on the inside. It also has a long zip so that if you need to clean the cover, you can do so with minimal hassle. You can move and bend the pillow around, place it between your legs, or flex it so you get as much support and comfort as possible. This body pillow is also suitable for those with back pain as well as pregnant women. Invest in a decent night’s sleep by purchasing this comfortable pillow from Cheer Collection. Not every body pillow on the market is going to suit your needs – especially if you are in a lot of pain. So, why not go for something different? Let Squishy Deluxe come to the party with their microbead body pillow. Instead of the more traditional memory foam or polyfill construction, this one features food-grade microbeads. Because of its spandex and nylon fabric coupled with double stitching, you don’t need to worry about beads going everywhere. Instead, worry about getting comfortable and settling in for the night. Because of its unique 47 x 7-inch dimensions, you can roll it under yourself, between your legs, or any which way for support. After a while, you can then remove the cover and wash it without any hassle at all. This pillow might be on the expensive end and can roll away from you, but once you get it sitting in place, you will see it’s worth its weight in gold. If you’re pregnant, struggle to sleep, or suffer from pain, then you may see the answer as a body pillow. If you buy the right one, it could be. Take the time to consider these points and increase your chances of a satisfied buy that you won’t send back. Pay careful attention to the body pillow dimensions. Is it going to be long enough, wide enough, and the right shape? The average body pillow is rectangle, but you can now get all manner of shapes and sizes to appeal. What does the filling consist of? Most of the best are memory foam – full or shredded – that contours to your body. However, polyester is now more common, as are food-grade microbeads. Consider your options and need for comfort. Pillows can take a hammering when you sleep. You lie on them all night, and can even scrunch them up without realizing it. Find out what others say about the durability and whether you’re rough on pillows or not. Always go for the pillow that handles wear and tear. Finally, is it going to be a body pillow you can wash? Many allow you to remove and wash the cover, while others say you can wash the entire thing in your washing machine. Unfortunately, some offer no wash options at all. Read carefully.